In this article we will show you, How to write a C Program to Print Right Angled Triangle Star Pattern with example. And also show you, How to print Right Angled Triangle Pattern with different symbols. 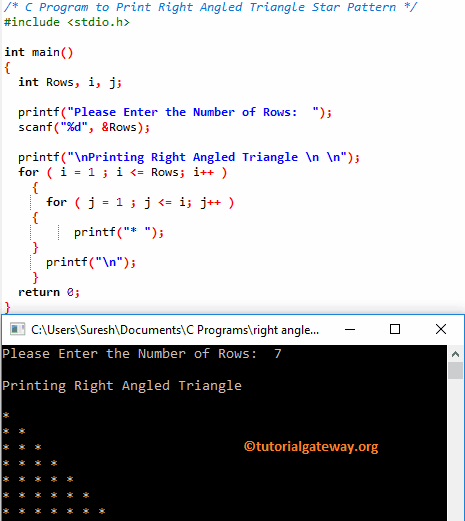 This C program allows the user to enter the maximum number of rows he/she want to print as Right Angled Triangle. We are going to print the Right Angled Triangle of * symbols until it reaches the user specified rows. This program allows the user to enter the Symbol, and number of rows he/she want to print. In this C program we just replaced the For Loop with the While Loop. I suggest you to refer While Loop article to understand the logic.